Kicking Horse is located in British Columbia outside the small town of Golden. 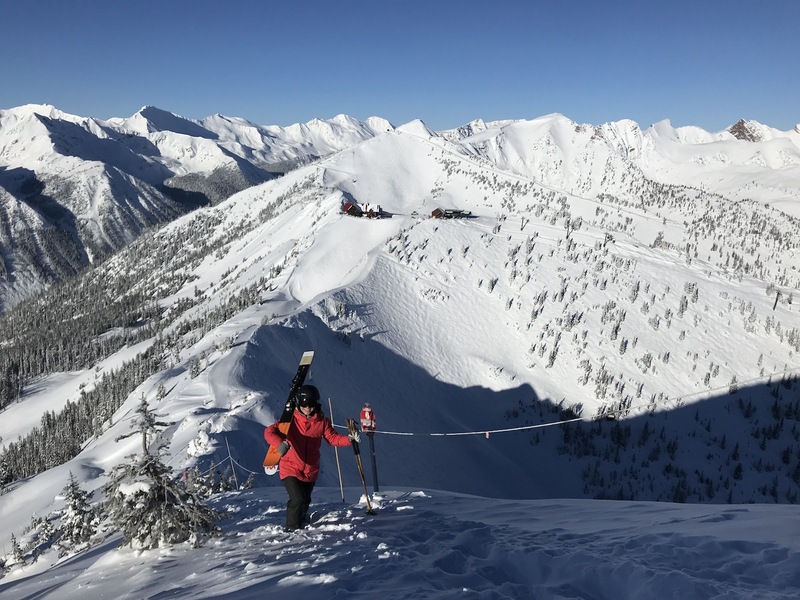 While many skiers and snowboards flock to Canada to visit the other big name resorts, this mountain truly shines in one distinct area: unbeatable hike-to terrain. 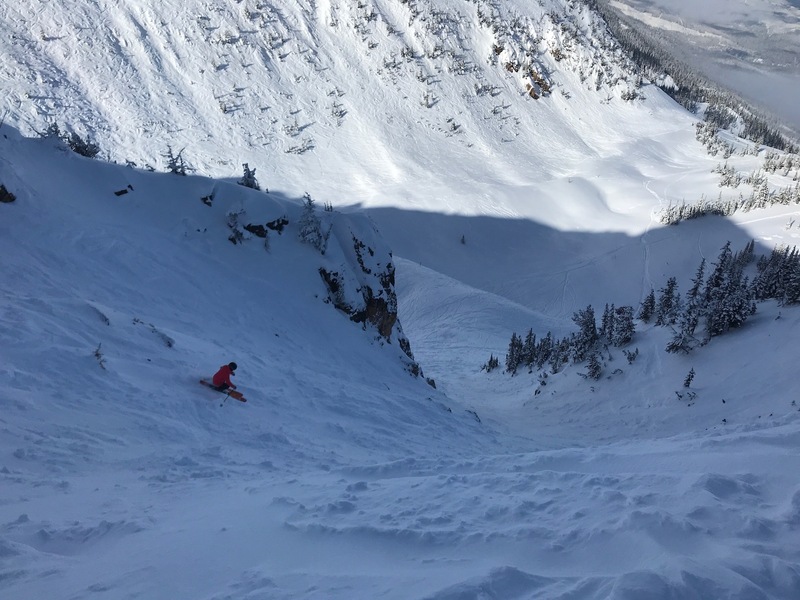 I made my first visit to Kicking Horse for three days during this past February and found the terrain not only jaw-dropping but incredibly beautiful. 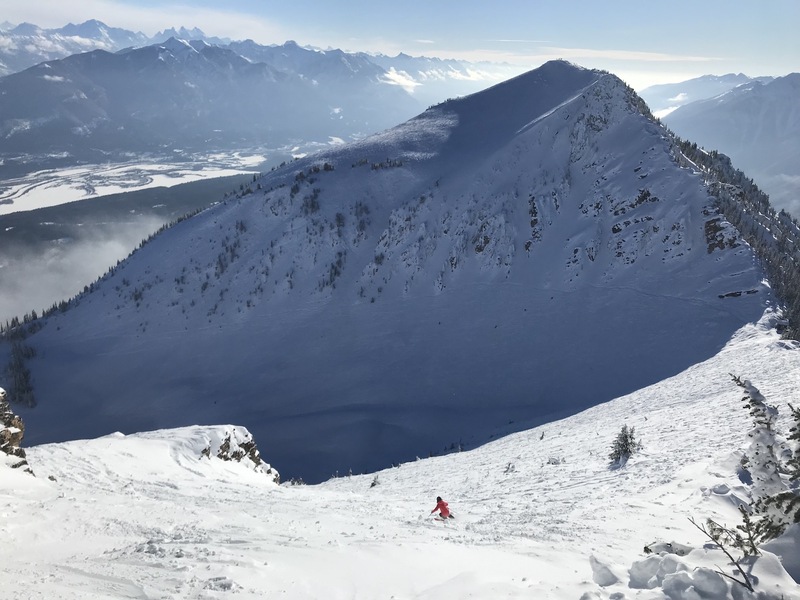 Kicking Horse Mountain Resort offers 3,486+ acres of skiable terrain, accessed by 1 gondola, 3 lifts, 120+ trails, and 5 alpine bowls. The mountain stretches from a base elevation of 4,314 feet to a summit elevation of 8,218 feet. Our friends at Zrankings list Kicking Horse's True Annual Snowfall at 253 inches. 53% of the mountain is considered difficult terrain, 23.5% intermediate, and 23.5% easy terrain. 45% of the mountain features an east-facing aspect, 30% north-facing, and 25% south-facing. We arrived in Golden on the morning of February 10th after skiing at Lake Louise near Banff, Alberta and before heading further west to Revelstoke. The temperatures were cold but the conditions were great thanks to 22 inches of fresh snow over the previous 10 days. After checking in at our Airbnb in Golden, we made the 15-minute drive up the resort. The free parking lot is located only a minute or two away from the base area so it's go-time as soon as you're ready. The 'Golden Eagle Express' gondola is your main artery to access the upper mountain so we quickly hopped on and made our way to the summit. From here, you have a plethora of options to consider. The photo above is taken from the summit of the gondola, looking north into 'Crystal Bowl' and towards the 'Stairway to Heaven' lift. 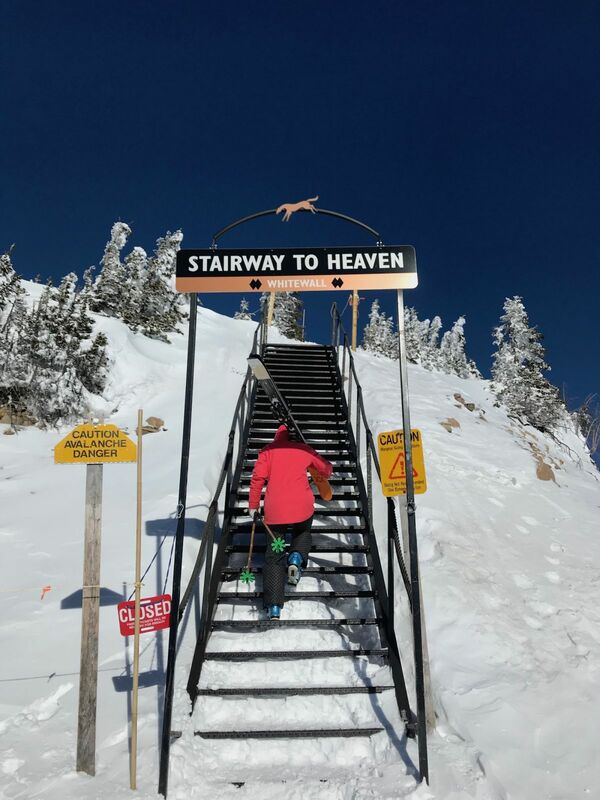 The gondola and 'Stairway to Heaven' are the two lifts to lap if you're skiing the upper mountain. To orient ourselves with the mountain, we started with a quick lap into 'Crystal Bowl' and back up 'Stairway'. 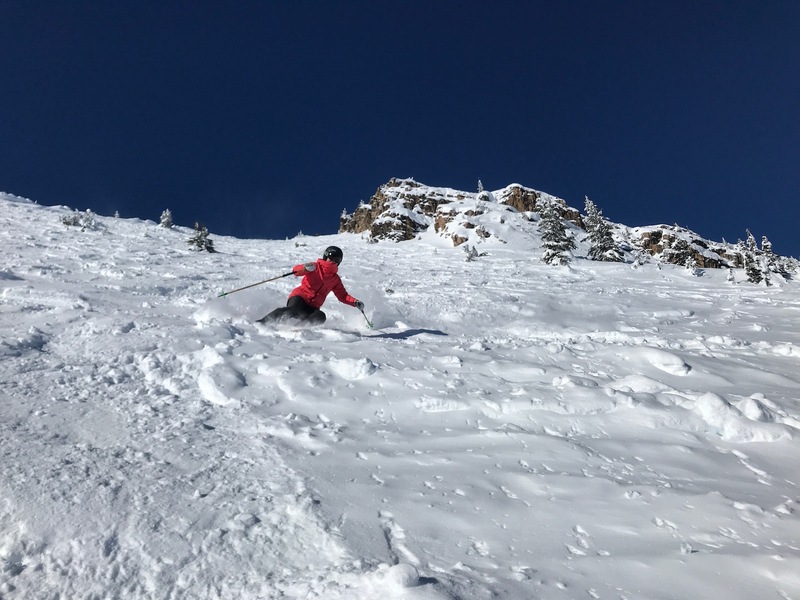 We spotted a great glade run under 'Stairway' and along 'Redemption Ridge' so we warmed up the legs with a few soft turns before cruising back down to the base of the gondola. 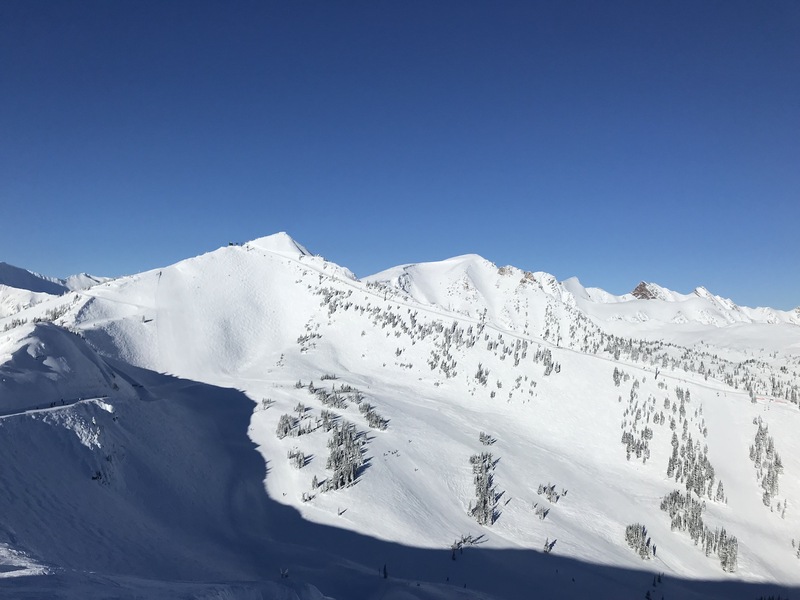 We talked to a local on the gondola and he recommended the hike up to 'Terminator Peak' and the ski into 'Super Bowl'. This required a 10-15 minute hike but the views and turns did not disappoint. The photo above is taken from the summit of 'Terminator Peak', looking north into 'Bowl Over' and 'CPR Ridge'. The two photos below come from 'Punter' on a southeast-facing aspect of 'Super Bowl'. Once you exit 'Super Bowl', you'll pop out into 'Crazy Legs' and eventually down to the lower half of the mountain. Even though this run requires you to ski back down to the gondola, it's 3,500+ feet so multiple stops will be in order. This type of run was our normal routine over the three days of skiing and I really enjoyed it as it provided a very long run, followed by a quick gondola ride back up to the summit. Moving onto other areas of the mountain, your options are endless. This includes grippy groomers on the lower half of the mountain to gladed trees along each ridgeline. But the one area that really caught our attention was 'Blue Heaven', 'Feuz Bowl', and 'Ozone'. This is accessed from the summit of 'Stairway to Heaven' and the short hike up to the entrance of 'Whitewall'. NOTE: This area should only be accessed if you're an expert skier or rider and feel comfortable negotiating steep and very rocky terrain. 'Whitewall' is loaded with steep chutes and rocky terrain so if this is your jam, hike up and dive in. We loved each line directly off the summit as there are multiple northeast-facing slopes to keep the conditions soft and chalky. 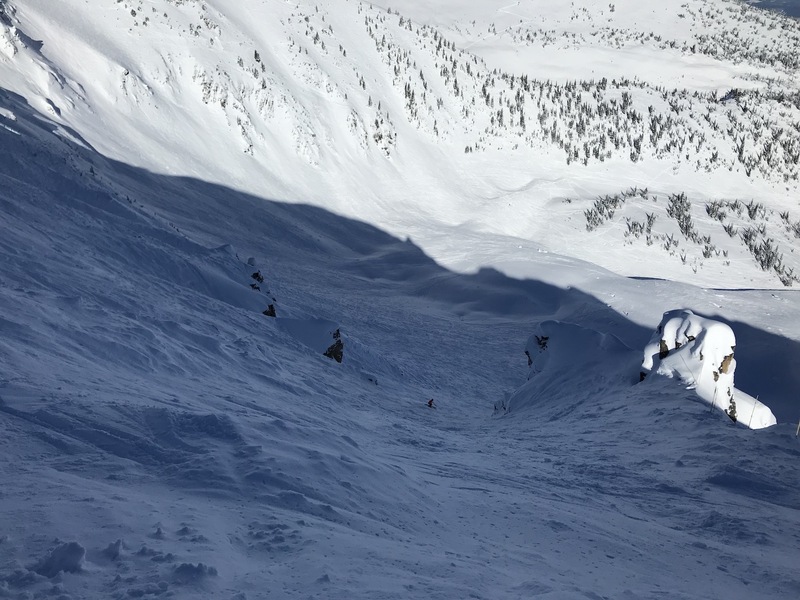 Exiting 'Feuz Bowl' also requires a long run back down to the gondola and much like 'Super Bowl', 3-4,000+ feet of vertical will take its toll after multiple days of hard-charging. The final two runs that we considered the "Crown Jewels" of Kicking Horse are 'Ozone' and 'T2 North Ridge'. 'Ozone' sits on the northern edge of the resort, while 'T2' straddles the southern edge. Each run requires a 20-30 minute hike and even though this might sound exhausting, the conditions more than made up for it. The first photo below is taken from the summit of 'Ozone', while the second photo comes from the bottom of 'Feuz Bowl', looking back up towards the run. The face is roughly 1,000 feet in length and features an average pitch of 44 degrees. This was the most nerve-racking but also the most satisfying run that we skied on the resort. 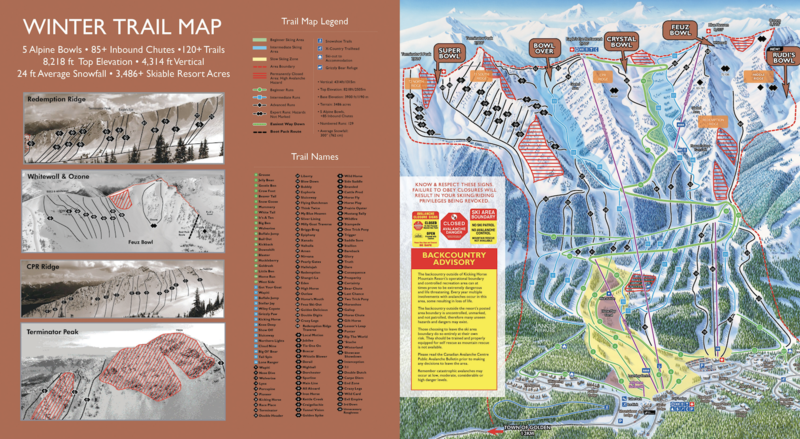 Interestingly enough, 'Ozone' is also home to the terrain for the Freeride World Tour stop in Kicking Horse. Click HERE to watch the winning runs from the 2019 event. Finally, there's 'Terminator 2 Peak' and 'T2 North Ridge'. This was our final hike on the final afternoon of our visit. The traverse south from the summit of the gondola requires multiple pitches to reach the saddle between T1 and T2. From here, you'll start the final hike that includes a steep pitch around an exposed rock face but don't worry, ski patrol was kind enough to include a rope to help alleviate any nerves. Once you reach the summit, you have multiple options but we opted for the direct line down the center chute. 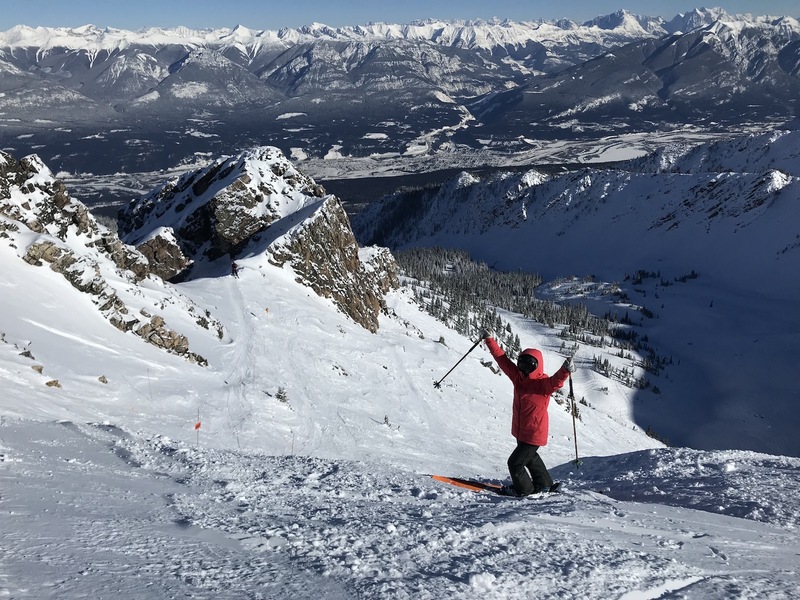 This north-facing chute featured fantastic conditions to cap off three incredible days of skiing at Kicking Horse Mountain Resort. 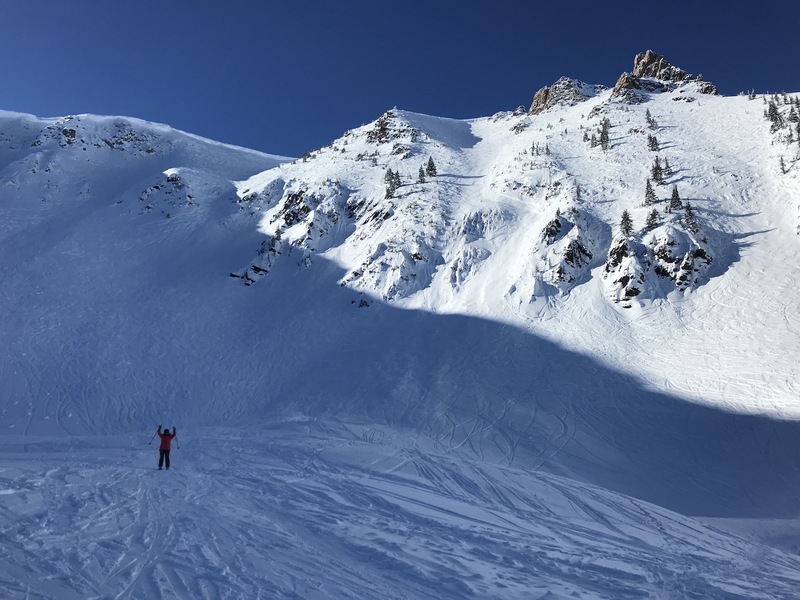 If you're considering a ski trip to the Canadian Rockies or already have plans to visit any one of the big name resorts, give yourself an extra day and explore the "Champagne Powder Capital of Canada". Visit KickingHorseResort.com for all lodging, event, and other ski-related information.